The Cloud Car Combatspeeder was originally introduced to provide planetary law enforcement agencies with a capable craft to aid in policing atmospheres across the galaxy. It has since found its way into the fleets of a wide range of organizations and individuals, largely due to its unmatched maximum airspeed. Aside from the typical patrol missions, it's commonly utilized for scouting, customs, traffic control, and even criminal activities. 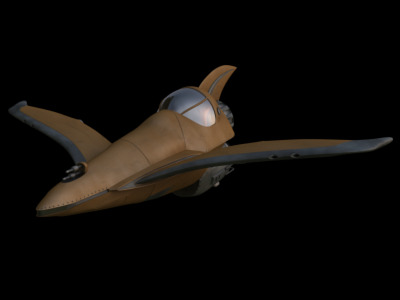 The key to the Combatspeeder's impressive speeds lies in its aerodynamic design and powerful engine. The Ubrikkian-designed "Servant" propulsion system combines traditional repulsorlift technology with advanced ion turbine thrust. The extraordinary engine is mounted in the rear of the speeder, beneath the cockpit, and completely exposed to the air for rapid cooling. The rest of the vehicle is simple in design and engineered to complement the Servant engine system. A single pod houses the engine and cockpit while two horizontal airfoils and a vertical fin behind the cockpit provide superior agility. In addition, three maneuvering jets and two emergency braking thrusters rests in each airfoil to further enhance the maneuverability of the Combatspeeder. Despite the peerless atmospheric mobility of the Combatspeeder, it is not without drawbacks. The weight and energy requirements of the engine forced its designers to make sacrifices elsewhere. The reactor is only able to provide enough additional power for a single double blaster cannon, mounted in the pod's nose. The inclusion of deflector shields and a comprehensive sensor suite proved impossible without overtaxing the power source. Engineers found that incorporating a heavier reactor with more output drastically reduced the speed of the vehicle, and deemed the outcome unacceptable. The hull plating of the Combatspeeder also suffered from weight restrictions, and its armor is comparatively lighter than other patrol craft. The resultant lack of durability requires pilots to rely on speed and agility to escape dangerous situations.